← Sesquipedalians for those who do not suffer from Hippopotomonstrosesquipedaliophobia! The 2008 financial crisis was a once-in-a-century catastrophe. It put our economy in Intensive Care from which it has taken us $23.7 Trillion to get out. If that number surprises you you’re not alone. Much of the $23.7T is Federal Reserve money printed (and still being printed) to bail out the banks – it is not subject to scrutiny or debate by the Congress and therefore not on our radar. The YouTube video shown below is MSNBC’s Dylan Radigan, talking about the big TARP lie: the Fed gave Banks Access to 23.7 trillion dollars not $700 Billion! But that is not the point of this post. The point is that all the pathologies that caused the 2008 financial crisis still exist. We are now forming another giant bubble, one that could potentially dwarf the previous one and one which we cannot borrow and print our way out of. Brett Arend of Marketwatch very elegantly sums it up in his article: The Next, Worse Financial Crisis. Ten reasons we are doomed to repeat 2008. His point is that the whole game played by our huge, dominating financial sector (more than 40% of the entire economy, producing nothing) is still crooked, and includes corrupt referees and skewed incentives. And the derivatives time bomb is bigger than ever. Ben Bernanke is allowing us to leverage up like crazy and there is no boost to the real productive economy. He is right but there is an even bigger factor – frictionless high speed trading that causes wild oscillations with self-amplifying gyrations. This makes the system mathematically unstable. 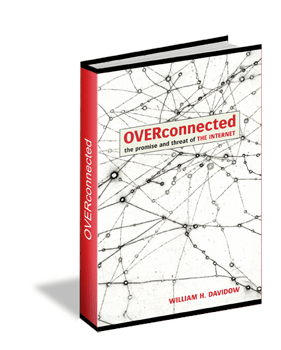 In his great book, Overconnected, Bill Davidow, a former Silicon Valley executive, successful entrepreneur, scholar, historian, and bestselling author, points out the extreme peril of our overconnected and undamped economy. He is talking about the feedback loop generated by the instant echo effect of the Internet but the same applies to our financial system and stock market. Over 80% of all Wall Street trades are done automatically by computers in microseconds. These tiny trades take out hundreds of billions in profits from the market without doing anything productive and materially increase the risk of violent moves and crashes, such as the one that occurred in May of last year, when the Dow Jones Industrial Average plummeted more than 900 points in a couple of minutes. What can Obama do to fix this? Do we need even more regulation, intricate rules for derivatives and other arcane products that Wall Street dreams up. Can the Federal regulators such as the SEC and the newly formed CFPB, Consumer Financial Protection Bureau, stay one step ahead of the all the financial mutations that the industry can throw at it? 1. A Federal tax of 1% on all financial market transactions (stocks, derivatives, commodities, futures trading etc) that exceed a threshold, say $100,000 per day. The idea is to not effect the small, legitimate trader. We should also make this tax revenue neutral. This can be done by reducing or eliminating taxes on Capital Gains and Dividend income. So no new taxes are added to the economy and capital formation for legitimate business activity is incentivized while in-and-out high frequency trading is punished. This alone would solve most of the problem – Just ONE regulation! 2. All market transactions should clear at the day’s closing, instead of being an instantaneous, micro-second trade. So if you put in an open order to buy XYZ stock you will get the price at the end of the day, a price at which the transactions clear given that whole day’s bid and ask activity. This is known as a Dutch auction and, in fact, is used very successfully in selling Treasuries. So if you, a small investor put out a bid to buy a 10-year T-Bill, at a Federal auction you will get the best price at which the entire lot clears when the auction is over. All buyers of a lot get the same price. Contrast this with our micro-second stock trading where the price can be manipulated instant-to-instant, creating great profits for the few at the expense of a volatile and inefficient capital market. That’s it! Problem solved. No need for the CFPB. Ok maybe a few tweaks will be needed but the idea is sound, simple and easy to enforce. It will, of course, never be adopted. Our political system won’t allow it. The financial sector has too much money and too much at stake to let our legislators do this. And, shockingly, Obama has not proven to be above all this either. So we live under the sword of Damocles – we don’t know when the next financial meltdown will occur but it will. It will take a catastrophe for us to act – apparently the 2008 disaster wasn’t big enough. How should you invest given that this catastrophe is coming? Good subject for my next blog. Cheerio! 2 Responses to Financial Disaster Looms – What Should We Do? Scary scenario. I look forward to your next blog suggesting investment strategies geared toward this situation. As you pointed out, I don’t give your suggestions much hope of being adopted. Keep blogging!